Stores selling beautiful Czech crystal and glass products are plentiful in Prague, as are those offering Czech porcelain. A unique gift is a handmade replica of historical glassware, such as drinking glasses from the times of Charles IV, Rudolf II, and other centuries. The opening times below are subject to change. Please check the store website for current information. Top quality Czech crystal, exquisite Moser glass products from Carlsbad (Karlovy Vary), Goebel porcelain, garnet jewelry, etc. Shipping available. Hours: Daily 10 a.m. - 11 p.m. 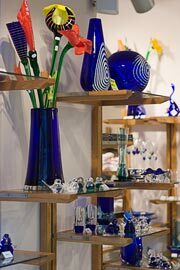 Established in 1992, the Blue Praha stores sell beautiful classic and modern hand-made glass products from the Czech Republic. Top quality Czech crystal, glass and jewelry in the Lesser Town (Malá Strana).